The fascia is the board that is nailed to the outer-most ends of the roof trusses. It provides a nice finish and more support tot he roof. 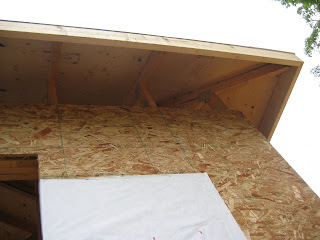 The roof sheathing is nailed down staring at this board. In the picture we are looking almost straight up the front wall of the Cottage at a corner, so you can see how the fascia is squared at the corners. Once the fascia is covered with a vinyl flashing the soffet will be install from the inside edge of the fascia board over tot he top of the wall.